GLENN RESEARCH CENTER, Ohio — Astronaut Jack Fischer’s favorite word is Awesome. And why not? If your job consists of rocketing into orbit aboard a Soyuz spacecraft and spending 136 days on the International Space Station (ISS), the word awesome is probably an accurate descriptor. Fischer shared this same enthusiasm and passion for his work during a visit last week to NASA’s Glenn Research Center in Cleveland, Ohio. The visit was part of Fischer’s official post-mission debriefing following his return from ISS Mission 51-52 on Sept. 3, 2017. Fischer is visiting a number of NASA centers not only to share his recent experiences in space, but to talk with and thank some of the scientists and engineers who contributed experiments and hardware to his mission. An audience of more than 200 people, mostly NASA Glenn workers, gathered to watch Fischer narrate a twenty minute video of his experiences in space. His engaging personality and good humor were evident throughout. It was clear that Fischer approached each day aboard the station as a day of important work and exciting discovery. “For me, the best part of being in space was going outside,” Fischer said. Fischer conducted two spacewalks during his stay at the ISS, both with fellow astronaut Peggy Whitson. Following his first spacewalk, Fischer declared his time outside the station was, “the biggest slice of awesome pie” he’d ever seen. Also on hand to see Fischer at NASA Glenn were groups of Girl Scouts from northeast Ohio who had spoken to Fischer during his mission via the Amateur Radio on the International Space Station (ARISS) program. The effort is a cooperative effort between volunteer ham radio operators and NASA that connects young people to astronauts orbiting aboard the ISS. Fischer spoke to the Girl Scouts on June 23 of last year, during a summer camp event that attracted more than 400 people. Fischer met with the Girl Scout groups after signing autographs and posing for photos with everyone in the audience who lined up to meet him. He also answered a number of questions from the audience and the media. One attendee asked how he trained to be able to operate and maintain so many different experiments and complex pieces of technical hardware. The always-positive Fischer saw only one downside to his work as an astronaut. Astronaut Scott Kelly, in his recent book Endurance, gave an account of the many problems he experienced with the station’s Carbon Dioxide Removal Assembly, or CDRA, pronounced Seedra. Kelly experienced frequent headaches and cognitive effects from rising CO2 levels, as well as frustrations in keeping the unit in good repair. Fischer was asked if he had similar experiences. Astronaut Jack Fischer stands beside an EVA spacesuit as he addresses an audience at the NASA Glenn Research Center. 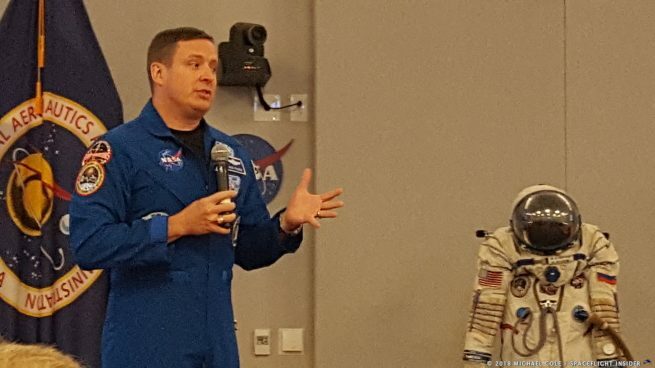 Fischer narrated a video about his time aboard the ISS, answered questions from NASA Glenn workers and the media, and met with local Girl Scout troops who had spoken to him by ham radio during his mission. Photo Credit: Michael Cole / Spaceflight Insider. Fischer arrived at the ISS with cosmonaut Fyodor Yurchikhin, joining Expedition 51 Commander Peggy Whitson, ESA astronaut Thomas Pesquet and cosmonaut Oleg Novitskiy. 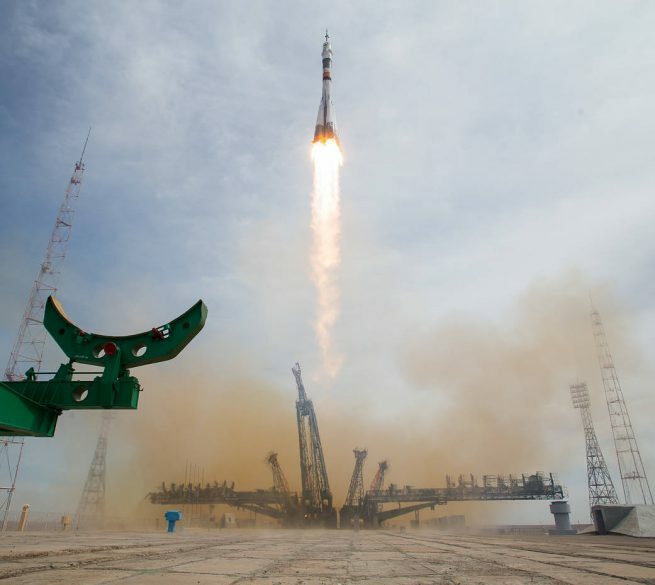 They were later joined by Expedition 53 Commander Randy Bresnik, European Space Agency astronaut Paolo Nespoli, and Russian cosmonaut Sergey Ryazanskiy. Fischer and Yurchikhin returned to Earth with Whitson aboard their Soyuz on Sept. 3, 2017. Whitson returned to Earth having accrued a total of 665 days in orbit during her three trips into space, giving her more time in space than any woman worldwide and more than any other American astronaut. In her most recent mission, in addition to her many duties, she even helped look after Fischer’s diet. Such creations earned Fischer a reputation for on-orbit dietary inventiveness. However, he claims that he was only trying to get calories efficiently. Fischer told the story of how he, like so many other astronauts and cosmonauts, got slightly taller while in orbit, as a result of the spine stretching due to prolonged lack of gravitational pressure. He grew from 5’11” to 6’1″ tall, and said he hoped his wife would notice. But it was not to be. Fischer has stated that he is looking forward to another mission to the orbiting lab. When he goes, it will likely be awesome. We have been studying humans in microgravity for half a century and the conclusion is obvious: Earth gravity and near sea level radiation are the prerequisites for long duration missions lasting several years. Nobody is going to sign off on permanently damaging people with profound debilitation and dosing. It is a challenge but certainly not a showstopper. This is the actual problem: requiring artificial gravity tether systems and massive kiloton range water shields generates shocked outrage and automatic denial because it means there is no cheap.